That was actually the year before I started grad school, so I didn’t actually know a thing about it at the time, but it was the subject of one of the first journal club presentations I went to, maybe a year after it was published — so it was still fresh and surprising. What a jaw-dropping way to start my new career! I was already interested in MHC, but this was the hook. 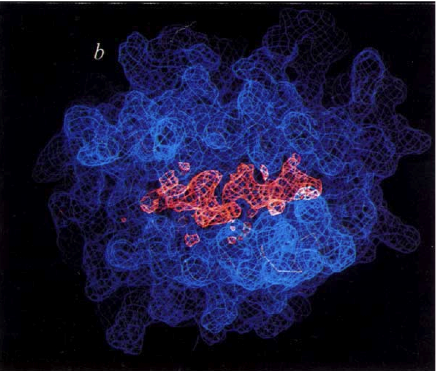 That figure shows a little bit of undefined, unresolved mist (in pink) in the middle of the reasonably well-defined HLA-A2 molecule. The location of that little bit of mist, and its very mistiness, were the stunning part of the paper. Of course, the location represents what we now call the peptide binding groove. (They had offered a drawing of the groove in Fig 2a [reproduced at the top of this post], but it didn’t click with me until I saw the later figure with the mist in it — then I went back and looked again!) 4 It offered a beautiful, clear, simple way to understand MHC function, a perfect dock for a peptide. At the time I had no idea that proteins could actually be so, well, physical — I had vague ideas of interactions and van der Waals forces and fancier stuff that held them together, it had never occurred to me that proteins were shaped like little Legoâ„¢ bricks, that could SNAP together with a satisfying CLICK. Here was something I could practically feel, pick up and move around, and it all made macroscopic sense. I think that I was not the only one who had the same reaction to the structure, too — this was the paper that led to a breakthrough in the use of structural information in immunology. The even more exciting part was that the mist was mist. Even though the rest of the protein was clear,5 the presumptive peptide was a blur. And the reason for that was instantly obvious, even to me: It was not a single peptide, it was a composite of hundreds or thousands of different peptides, all superimposed on each other. That blur was the secret of MHC specificity, and of MHC complexity. Again, a very physically satisfying explanation. This second paper was less physical, more cerebral, and it took me longer to understand most of their arguments. It didn’t matter. They had me from that little blue-on-black square in the first paper, and I was happy to spend the time reading and thinking that the second paper needed. Bjorkman, P. J., Saper, M. A., and Wiley, D. C. (1987). 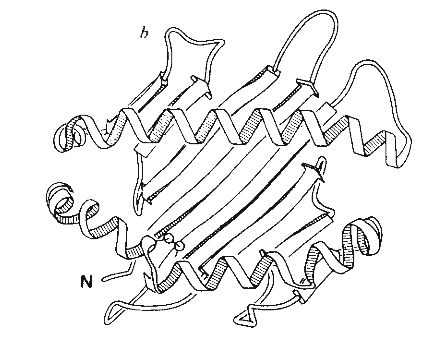 Structure of human class I histocompatibility antigen, HLA-A2. Nature 329, 506-512. Bjorkman, P. J., Saper, M. A., Samraoui, B., Benett, W. S., Strominger, J. L., and Wiley, D. C. (1987). The foreign antigen binding site and T cell recognition regions of class I histocompatibility antigens. Nature 329, 512-518. This entry is filed under MHC, Science. You can follow any responses to this entry through the RSS 2.0 feed. Both comments and pings are currently closed.